I have a salad dressing for you today that is made with fresh cucumber, and it is the best tasting salad dressing that I have run across in a long time. My mother introduced it to me. 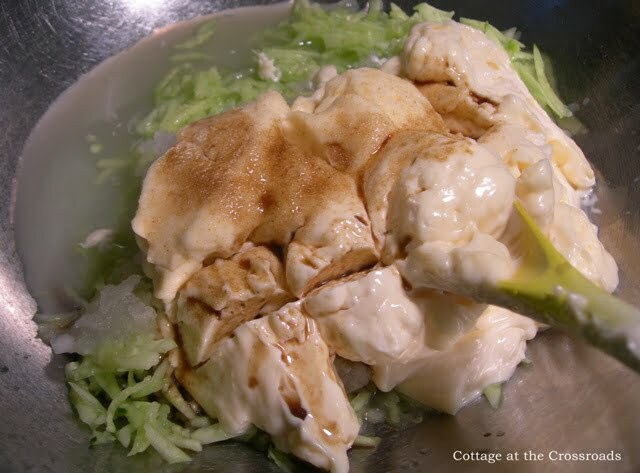 I had given her some of our homegrown cucumbers, and she found the recipe for this dressing in an old cookbook. She was so pleased with it that she asked me to taste it. It was so refreshingly good! I immediately copied down the recipe and made some myself. Everyone that tasted it loved it. 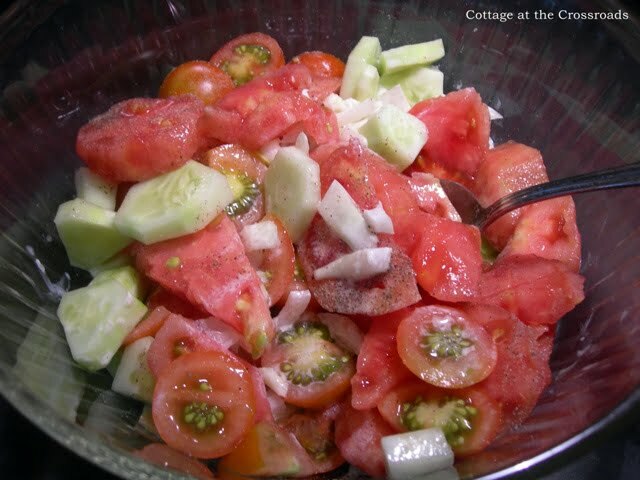 It is so good with our favorite, a salad of tomatoes, onions, and cucumbers. But it would be equally good on a lettuce wedge, a garden salad, or used as a dipping sauce. 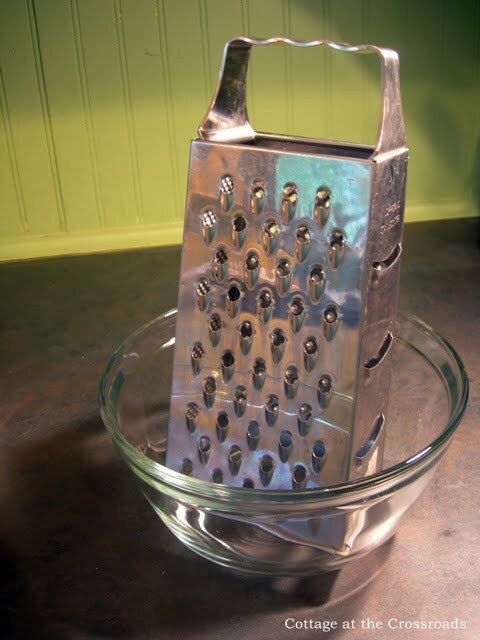 You will need a box grater to grate the cucumber and onion. The next time I make this dressing, I will use my food processor, but this recipe came out of an OLD cookbook so I followed the directions as printed. 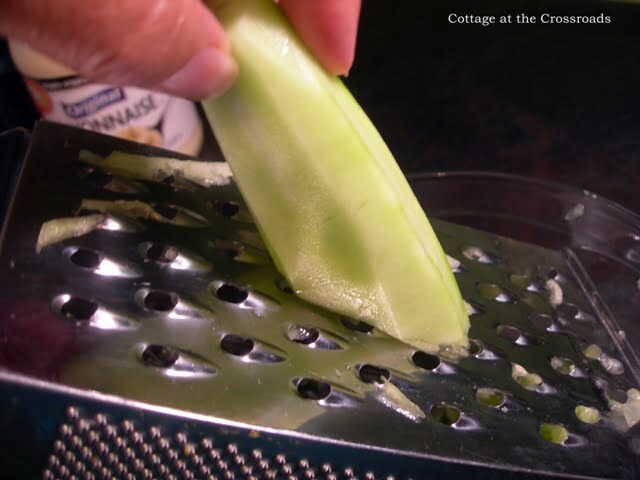 First, grate the cucumber using the large holes on the grater. Allow the cucumber to sit for a few minutes and then drain off the liquid. 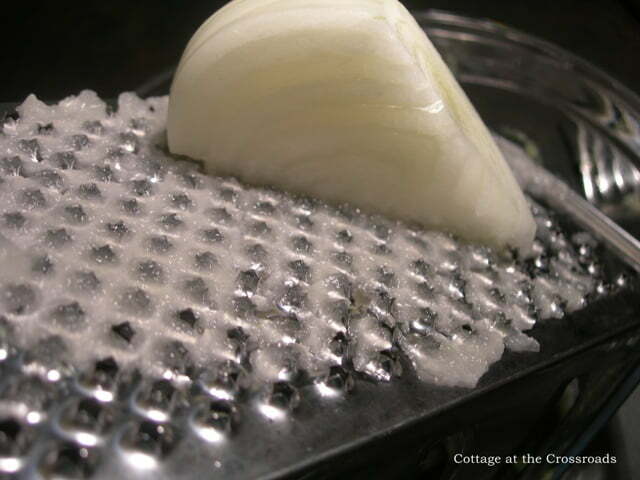 Grate the onion using the small holes of the grater. This will produce some onion liquid but save the liquid! It gives the dressing wonderful flavor. 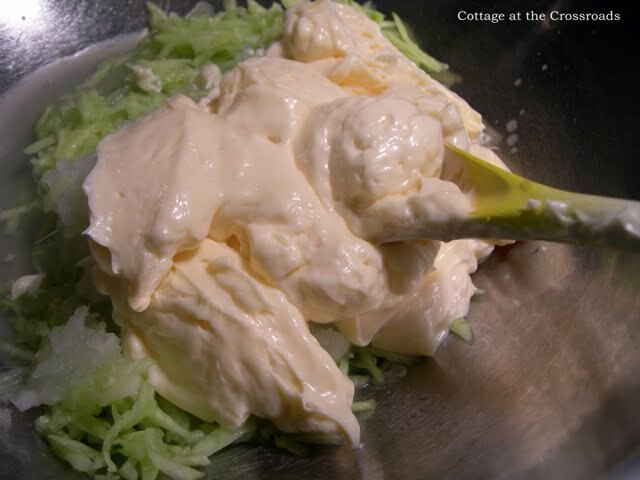 Place the grated cucumber and grated onion in a bowl. Add 1 cup of mayonnaise. Next, add 1/8 teaspoon garlic salt, 1 tablespoon lemon juice, 1 teaspoon sugar, and 1 teaspoon Worcestershire sauce and mix it all together. Pour it into a container and refrigerate. Oops, I was a little messy! All clean now. I actually doubled the recipe when I made it today so I could share with my sister-in-law. 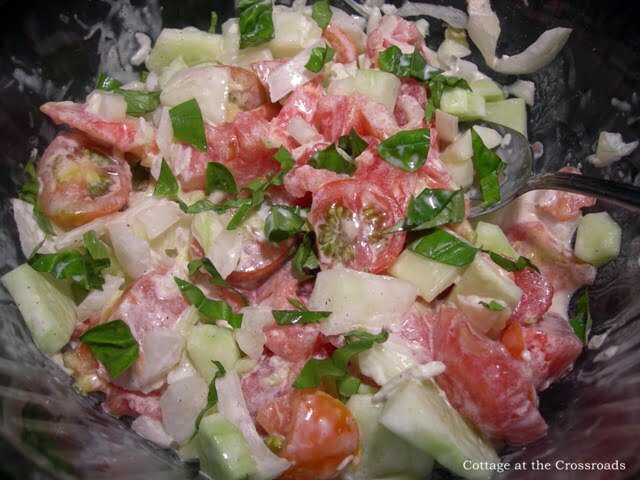 Our favorite summer salad is made with tomatoes, onions, and cucumbers. The dressing is just fabulous with the salad. This recipe is a real keeper, and if you’d like a printable copy, click here. Can I use Greek yogurt or would plain yogurt taste better? Also is this freezable because I we can’t eat it in a week? Thanks for the help. Kathy, I have never made this recipe with yogurt but I would think that plain Greek yogurt would work. If you try it, please come back and let us know how it worked. And I really don’t know if this would freeze well or not. This looks good and uses ingredients that I have so I think I shall have to try it soon. Thank you! Is it sweet? My family loves sweet creamy cucumber salad. I’m not sure if I’d describe it as sweet. Fresh is the word that comes to my mind. But if you’d like a sweet dressing, just make up a batch and add a little sugar to get the taste that you’d like. Thank you! I will be making this dressing. I love recipes from the past???? Do you know how it keeps in fridge? I wouldn’t keep it more than a week, Kim. I don’t usually drain the grated cucumber. Ok thanks! I made it w half plain c plain yogurt and half c mayo and I did add the onion liquid but not the cucumber liquid. It was amazing! A little thick but next time I won’t drain the cuc liquid. Yum! Thanks for coming back to give your feedback using part yogurt and part mayo! I was looking for something a little different and this was the answer! Dare I say I snuck in a “little” jalepeno for a kick. Thanks so much! I’ll have to give that a try soon, Sally! Using yogurt is a great suggestion, Carole! Do you think this would work as a substitute for regular mayonaise in chicken salad? I’ve never tried it with chicken salad but it sounds like it would be delicious! Let us know if you try it. I would try it myself but Leo is allergic to chicken (and all fowl!) Weird, I know! To answer my own question, this worked perfectly in my homemade chicken salad. And I think it will be even better tomorrow after the flavors have a chance to meld overnight. thanks so much for sharing your delicious cucumber dressing. Photos are beautiful; text is clear and well presented, with measurements beneath the pics. I just made the dressing and our whole family likes it. Quite a feat since each of us has different tastes, with one vinaigrette, a blue cheese,and a thousand island lover and the twain did meet with your dressing..thanks again. Also this is a very attractive website. I have always liked cucumber dressings but never made one, look forward to trying it! This sounds good, thanks for sharing it! Just wondering if you can make several jars of this and do a hot water bath to seal the jars (can it) for use later and if so what would the shelf life be? Renee, I don’t think there’s enough acid in the dressing to safely can it using the water bath method. Luckily, cucumbers are readily available year round! Since it has mayo in it, absolutely not. This is why you don’t take potato salad on an outing taking place outdoors. Spoilage. 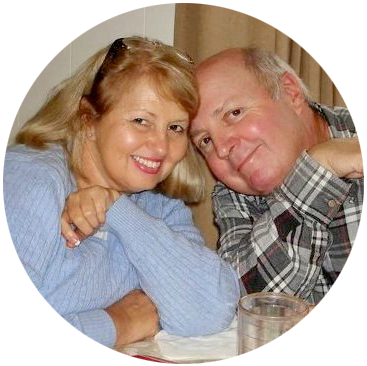 Hi, thanks for sharing your recipe for cucumber salad dressing. 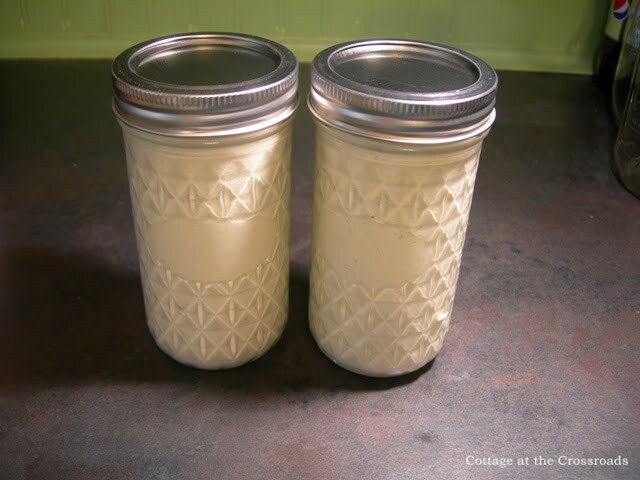 I can’t wait to make it with my fresh homemade mayo and fresh lemon juice. I have a feeling it will be DELISH! Your homemade mayo sounds delicious as well! i’m making this tomorrow. Looks relish. I’m not a big mayo person, so I will be using yogurt. Hope it takes as good as yours looks. Thanks to you and your mom. BTW, I love your cottage. Just made this dressing and it is delicious! I could drink this stuff!! Kathleen, thanks so much for taking the time to come back to leave your comment about the salad dressing. And I am delighted that you really like it! Anybody reading right now cucumbers are on sale at Winn Dixie this week. Looks sooooo yummy(: going to try switching the mayo with plain yogurt! Exactly what I was looking for thanks so much! I was thinking the same thing about substituting mayo for the yogurt. Did you try it and did it come out. 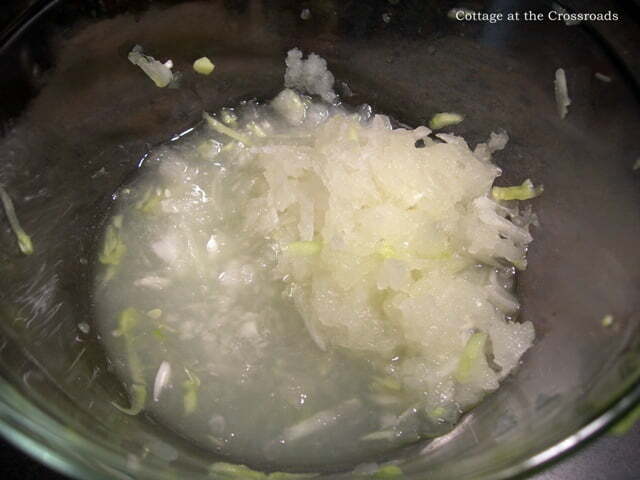 In making the cucumber salad dressing, do you leave the peeling on and grate it as well? It looks really good and I plan on trying it. Julie, I don’t see any reason why you can’t leave the peel on the cucumber. In fact, little flecks of green would look pretty in the dressing. When you make the dressing, let me know which way you prefer it! Sounds so good, can’t wait to try it when I can have dairy again. I am from India and came across this recipe when I googled cucumber salad dressing. Thank you for posting,I am sure this is going to turn out great and make me eat more vegetables. This is a wonderful recipe and we thank you for sharing and your Mother for finding it. It sounds like a good one. I have a ton of cucumbers growing in my garden. Do you have any idea how long it might keep in sealed jars? Will try the Dill relish and bread and butter pickles next. This one is a keeper. 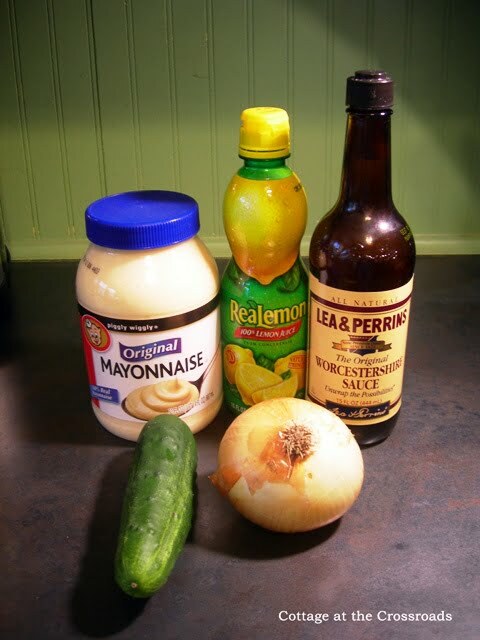 Just wanted to drop by and let you know that I made your dressing this evening with one of my cukes and a noon-day onion. Served it over vine ripe tomatoes and also dipped some fried green tomatoes in it too. Very good. Love the cucumber flavor. Thanks for sharing your recipe. Thanks for the cucumber salad dressing recipe. i am sure we will enjoy. I bet it is really good. I love cucumbers…. This sounds really good! Thanks for sharing so many of your wonderful recipes!! Oh my Jane that looks so delicious I am gonna make it. Thanks for posting it. I can almost taste it – looks delicious!! This recipe looks yummy. I love homemade dressings! We make a dressing very much like this one for our Gyros! We stir fry chicken, onions and peppers…toast pita bread and then load it up with the stir fry mix, lettuce and tomato and cucumber dressing! OH MY! It is SO good! 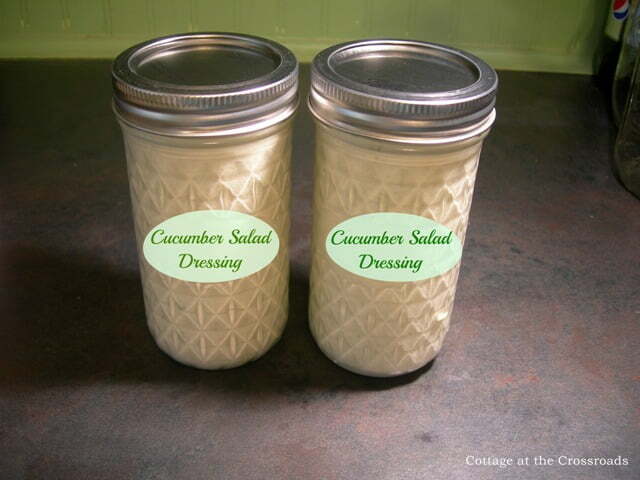 Your dressing is perfect for so many dishes! Oh my does that look good! Love fresh tomato and cucumbers this time of year! 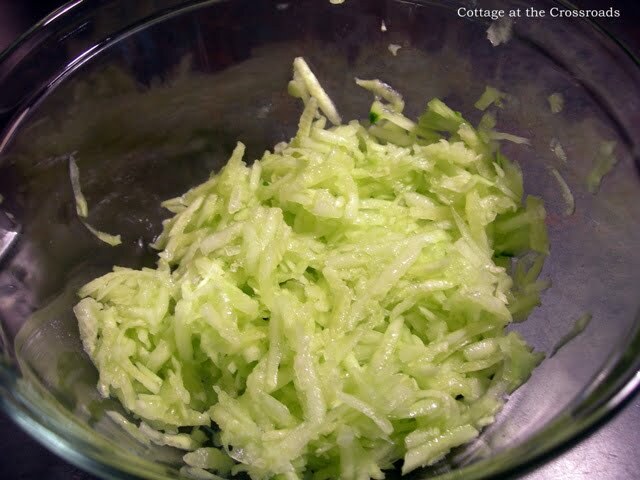 I love any recipe involving cucumber and I could do this one easily and I have a food processor. Thanks Jane. thanks for the recipe! i am going to make some of this today! I have an abundance of little cherry tomatoes and this would be a great dressing for the tomato slads I have been eating everyday!! Sounds very good! I am jealous you have fresh veggies from your garden already! 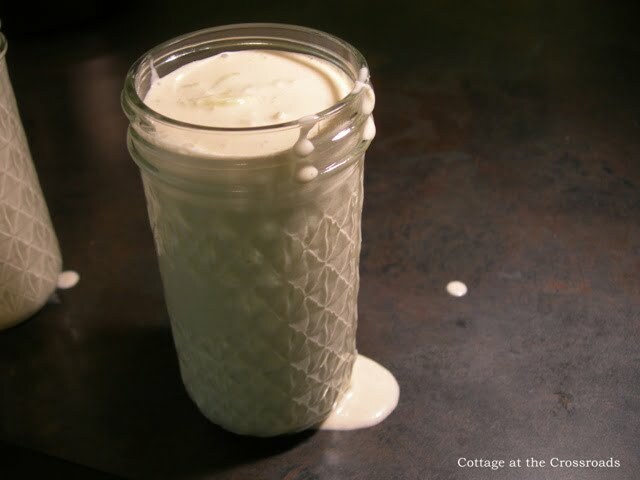 Jane…what a wonderful recipe…I have not purchased bottled dressings in a long while now and look for great salad dressing recipes…this is one that I will be trying this weeks…Looks wonderful! Yummy! that looks delicious. Thank you for sharing. This sounds delicious! I will be tryong this today.I love discovering new-old recipes in cookbooks. I guess thats why I have so many and can’t resist buying more! My mouth started watering as soon as I saw the ingredients! This looks and sounds delicious. I’m so glad you shared the recipe at Show & Tell. I’m pinning it to my recipe board on Pinterest. I’ll be sure to post about it when I try it! Thanks for the recipe Jane! Looking forward to trying it out! I bet that is delicious!! I can especially imagine it with your homegrown ingredients. Thanks for sharing the recipe, Jane.